With a new poster, character feature and TV spots, the final push before launch has started in earnest. From the clips and trailers it does look good. 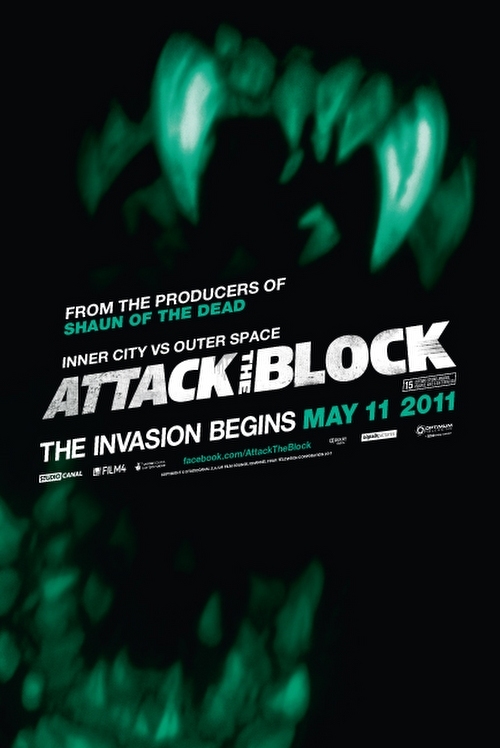 Attack the Block is a fast, funny, frightening action adventure movie that pits a teen gang against an invasion of savage alien monsters. It turns a London housing estate into a sci-fi playground. A tower block into a fortress under siege. And teenage street kids into heroes. It's inner city versus outer space. While Sam and the police hunt for the gang, a second wave of meteors fall.Confident of victory against such feeble invaders, the gang grab weapons, mount bikes and mopeds, and set out to defend their turf. But this time, the creatures are bigger. Much bigger. Savage, shadowy and bestial, they are hunting their fallen comrade and nothing will stand in their way. The estate is about to become a battleground. And the bunch of no-hope kids who just attacked Sam are about to become her, and the block's, only hope.